The Choir Girl: Congratulations CCC! 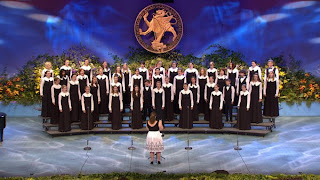 I must say a huge amount of congratulations to the choir of my teenage years: The Cantilon Chamber Choir for winning first place in the Youth Choir category at the Llangollen Music Eisteddfod in Wales this year! I saw that they also managed to snag second place for the Female Choirs category as well. Very nicely done. How far technology has come since the years that I performed in this very same festival. All there was in 2003 was a slowly updated website with photos that linked to an expensive photo purchase site. Not very exciting. I was impressed with the social media presence of the festival. Also, they have all the video media from the festival streaming on their website! It's is great for people like me who can't attend the festival but who want to hear what's going on. It's a bit of deja vu watching their performances since I've sung most of the pieces and have worn that very same uniform on that stage. There was one point when they were singing "Hosanna" in the Senior Children's Choir category and it was like I was on the stage with them. I could breathe the humid air, smell the sweet scent from the fresh flowers that lined the stage, and see the haze of the audience underneath the amphitheater tent stage lights. Although I do not recognize many of the faces there, it's comforting and exciting to see the new generation of the choirs' singers. It also appears that the "Choir of the World" award goes to the Adventist University of the Philippines. I listened to their Choir of the World competition piece. Typical sacred Latin text set to music. It's very nicely done but I would have loved to have heard something with a bit more musical character. It felt like a safe choice. Listening to choirs at an international festival is the time to get inspired by wonderful choral pieces and have a chance to hear things I haven't heard before. I wasn't particularly moved by their choice in repertoire. Take a listen and tell me what you think. Also, you can bet that I'm going to be combing through the video archives listening to the other choirs. If I find anything that sparks my attention, I'll be sure to post it here. If you find something that is interesting feel free to post it in the comments below!